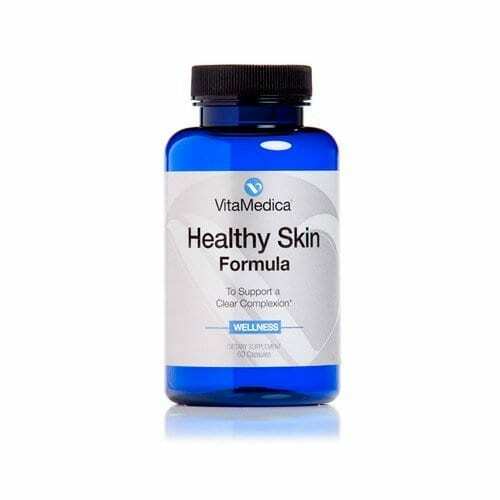 Enjoy 5% savings with this monthly subscription for Vitamedica Healthy Skin Formula. Always have a steady supply — without the hassle of reordering each month. To increase the absorption of the Healthy Skin Formula and for increased acne clearing, it is highly recommended to pair it with the VitaMedica Fish Oil. Supplement Facts: Vitamin A (from Betatene) 7,500 IU, Vitamin A (ad Palmitate) 5,000 IU, Zinc (From Zinc Amino Acid Chelate) 24 Mg, Selenium (from Selenium Amino Acid Chelate) 48 Mcg, Chromium (from Chromium Amino Acid Chelate) 150 Mcg. Directions: As a dietary supplement, take one to two capsules of Healthy Skin Formula with food. Each individual is unique and nutritional requirements may vary. Notice: Do not take if safety seal on bottle is broken. KEEP OUT OF REACH OF CHILDREN. If you are diabetic, pregnant or breast-feeding, seek advice of your physician before using this product. Store in a cool, dry place. CONTRAINDICATIONS: HEALTHY SKIN FORMULA contains Vitamin A. If you are presently taking Accutane® (isotretinoin) for the treatment of acne, please refrain from taking HEALTHY SKIN FORMULA until the end of the treatment cycle.